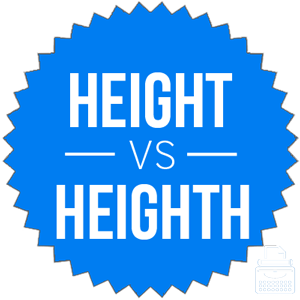 Home » Height vs. Heighth – What is the Difference? As English evolves, spelling conventions change along with it, and many words that have been part of the language for centuries must undergo changes to fit current trends. When you hear English speakers describing how tall a person, building, or mountain might be, they are probably describing its height. Some speakers pronounce the word so that it ends in a -th sound, though. Which version is correct? The original form of this word was spelled much differently than its modern counterpart, but there is still only one standard spelling today. What is the Difference Between Height and Heighth? In this post, I will compare height vs heighth, and use each version in an example sentence, so you can see it in context. I will also use a mnemonic device that should make choosing height or heighth easier for you, as well. Jackie does not want to hike the gorge, because she is afraid of heights. If you drop an egg onto a hard surface from even a moderate height, it will crack. Height can also mean a measurement of vertical size. It is common to measure the dimensions of three-dimensional objects according to length and width (two horizontal dimensions) as well as height. Jerome was proud of his unusual height, and brought it up in conversations at every opportunity. The height of the chair was too much to fit under the table, so Emily sat on a small box instead. The word height is common in place names, like Wuthering Heights, where it describes an area of higher elevation than its surroundings. Many cities have neighborhoods or boroughs designated as heights. What does heighth mean? Heighth is a misspelling of height. It might exist because of a perceived similarity to other words that end in -ghth, like eighth. Other measurements, like depth and breadth, also end in -th, so some writers might overgeneralize this ending to heighth, as well. It could also stem from a mispronunciation of the word by some speakers. Possibly the most convincing explanation is that the word originated in Middle English as heighthe. While the last -e dropped off along the way, it has taken English users a bit longer to fully dispose of the third -h.
No matter the reason for the misspelling, it is clear what the Standard English spelling is today. The chart below graphs heighth vs. height in English books since the year 1800. As you can see, the last time heighth made a blip on the radar was in the early 1800s. Height is the only correct version of this word today. Heighth is no longer considered a standard spelling of this word, if it ever was. Since height rhymes with flight and might, two other words that end in -ght, you will always know how to spell the ending of the word. Is it heighth or height? There are many possible explanations for the persistence of this mistake, but there are no possible reasons to use heighth in modern writing. Height is the correct spelling. 1 What is the Difference Between Height and Heighth?